I was trying to turn this simple block into a 12 and one half inch block. It started out as two thirteen inches squares I kept breaking into triangles. all of a sudden it was only 12 inches square and looks too simplistic. I wanted it to be all blue. I am wondering if I could cut it down to 10 inch square and add a border so it would end up 12 and a half inches . A different blue for the border. What do you think? suggestions welcome as I haven't sewn blocks for a long time and it is like starting all over again. Been doing the dolls for sick kids, and moving back into some quilting for a change. Can you help??? Thanks Mama. appreciate your taking time to reply. Hugs. I think that maybe the blues are too similar in tone, and that's why you're not happy with it. Do you have a blue that is much lighter and another that's sort of a "royal" blue? Also, if you join the blocks without sashing then they will look like large squares set on point,meaning you needn't have cut them into triangles at all. Maybe match the dark blue in the embroidery material with a 2 inch sashing. I think I'd cut it at least one more time, then add a much darker border. I agree but would miter the corners to match the lines of the triangles. I agree - the blues are too similar in value. You need a much lighter / much darker combo. I'm afraid you'll loose the triangle work you did with those colors. And do cut it down like everyone said. I'm always for the simplest way...I vote for cutting it down and adding the darkest blue border possible. Let us know how you finish this, okay? This is the same amount no matter how large or small the starting squares are - assuming 1/4 inch seam allowances. Thanks for all the help ladies. Guess I won't toss it. Maybe just cut it down and find a lighter or darker color to border it with. 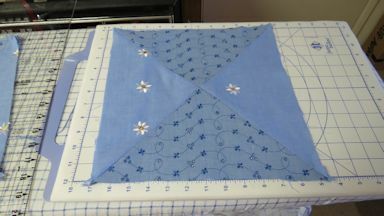 What would happen if you cut your block to 10 1/2 inches then used the opposing fabric on each triangle for a border. I vote for sashing of either light blue or dk. blue if you want to keep the quilt in blues. I think the triangles will show up better. What if you used dk. blue sashing with cornerstones made of one of your print fabrics to help tie it all together. Still thinking....But you said you want a 12 1/2" block. Hmmmm....If you cut it down and add borders to make it 12 1/2" then sew them together it will be like having a seam down each "sashing" strip. (Am I making any sense?) 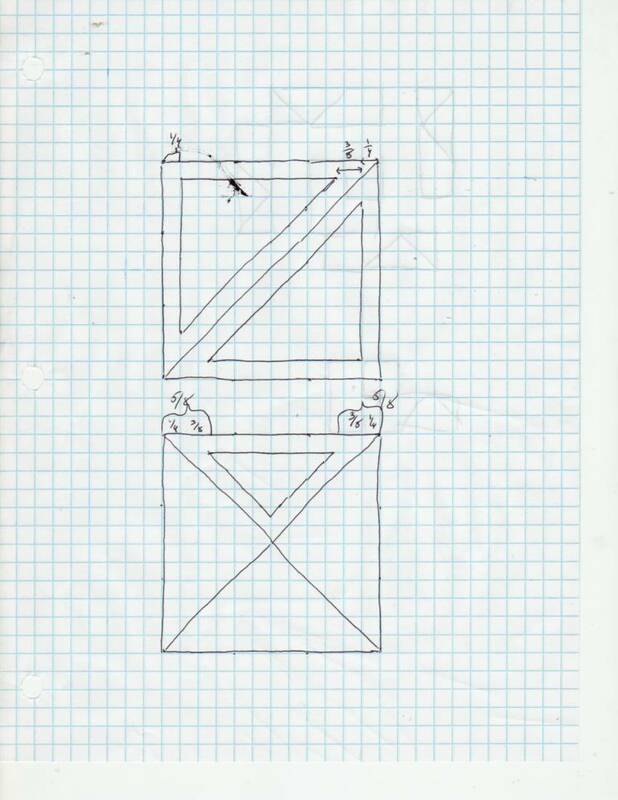 Rather than border each block before sewing the blocks together, wouldn't it be better to just use traditional sashing strips between blocks? By the way, I'm of the opinion there is no block beyond rescuing...just plenty of creative opportunities! 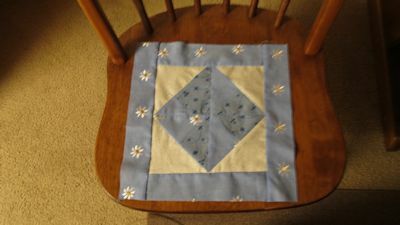 I think it would be great simple like this, if you were going to do some decorative free motion quilting on it. I really like your blues. I am anxious to see how it ends up. I think your blue is a lovely color but there is just no contrast or interest. I am wondering what a darker blue to match the darker stitiching and then a white for more contrast. Are your really "married" to the block size? Play with it a bit to see what comes up. Have fun!